A new departure in clubs for American women - an exclusive New York organization whose club-house, recently opened, is a model of comfort and of tasteful decoration. London has long been famous for its women's clubs, patterned after those of the men, even to the smoking-rooms and wine-cellars; but until recently what American women called their clubs were nothing more than houseless affairs, synonymous with a lunch at some fashionable restaurant, followed by a "paper" on the subject for the day and a subsequent discussion of its contents. 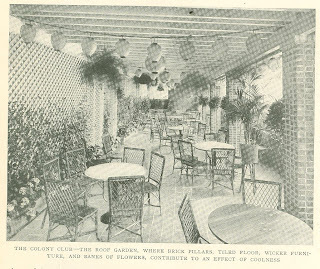 The club that meets intermittently for intellectual improvement or mutual di­version still flourishes; but nowadays the trend in club life is toward the purely social organization with a permanent home, where its members can give a din­ner or a dance, take a plunge in the swimming pool, or have tea on the roof garden; where they can drop in to read, write, rest, or chat, and find about them all the luxuries of their own houses, with the added advantage of freedom from personal care and responsibility. 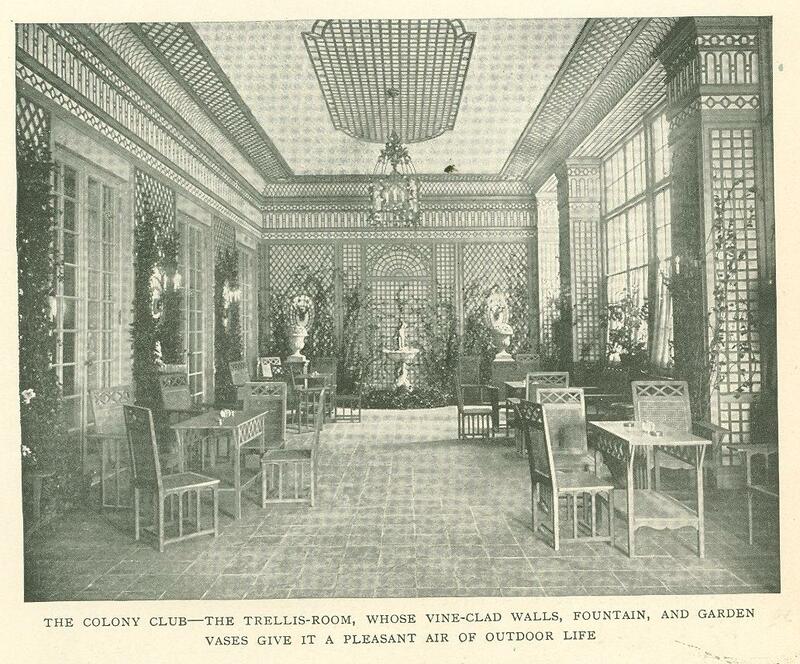 The idea of the Colony Club origi­nated five years ago with three New York ladies - Miss Anne Morgan, daughter of Mr. Pierpont Morgan; Mrs. Borden Harriman, and Miss Helen Barney, now Mrs. A. S. Alexander. A board of. 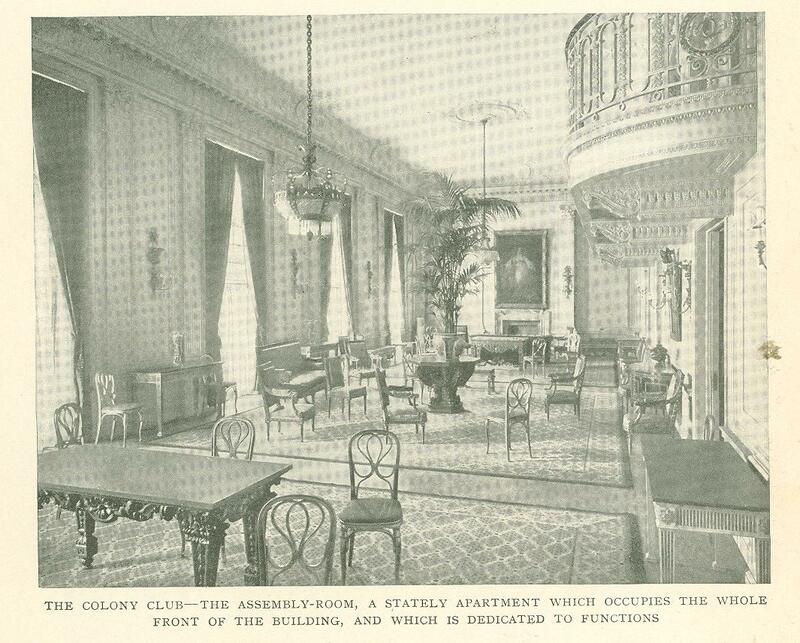 governors was instituted, its members being well known society women; a site for the house was chosen, and its designing was placed in the hands of the well known firm of McKim, Mead & White. The late Stanford White was the chief architect of the building, which stands on the west side of Madison Avenue, above Thirtieth Street. It is colonial in style, built of brick, with a porch or balcony supported on slender Corinthian pillars. It has the appearance of a comfortable and dignified private residence, rather than that of a clubhouse. 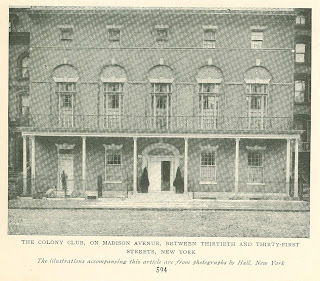 This aspect is en­tirely in keeping with the spirit of the club, which is, not unnaturally, very ex­clusive, the membership being strictly limited to the inner social circle of the metropolis, with only such charity toward the arts as would include women of indisputable talent and achievement. 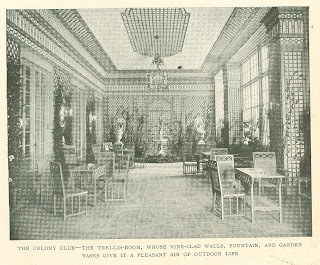 The decoration of the clubhouse was entrusted to Miss Elsie De Wolfe. For such a task Miss De Wolfe is fitted by that most secure of all educations, a long independent personal pursuit of a favorite subject. She had been trained by residence abroad, where the decora­tor's assistants are the centuries them­selves, and by her innate sense of beauty and fitness, of which the key note is per­haps an aristocratic reserve. This note is felt in all the decorations of the Col­ony Club, yet it does not imply unliv­able showrooms furnished to exploit a "period." The clubhouse is homelike and serviceable throughout, offering and not obtruding its background for the various functions in which it serves. Lovers of magnificence or of mere costliness, the "yellow rich," or even the unworthy poor, might find this house, with its chintses, its tinted walls, and its unobtrusive, comfortable furni­ture, a very plain affair. But its signifi­cance is in its simplicity and fitness ­two notes needing emphasis in a genera­tion which would gild the very kitchen faucets and put hoops of gold around the ash barrels. Gold is used sparingly in the Colony Club - at least on the surface! The entrances passed - and of these there are two, one for members and one for strangers, who use also a separate elevator - the central apartment of the ground floor is a wide and lofty hall, whose aspect is a compendium of the house. The pilastered walls are desti­tute of any ornament save the colonial mirror and the gracefully shaped ap­pliques which support the side lights. The chandeliers of the center lights are of a quaint and rich design, copies of historical originals in the Cooper In­stitute. A cheerful feature of this room is the green and white striped chints uphol­stering of the sofas and armchairs, a glazed English variety of the fabric nearly as impervious to dust and dirt as a highly finished leather. The chairs are supplemented by others of richer pat­tern, including two of hand embroidered tapestry. Every really beautiful house has some message to convey, even to those whose purses are slender. Walking through. the rooms that open from this central hall, the visitor wishes that they might be seen by all those who are evolving from the onyx top table, bric-a-brac, and plush stage of existence into better things. Here is no erysipelas of orna­ment, reminding one of a hotel lobby, but dignity, spaciousness, and quiet, homelike charm. The reading-room is "Adam " the decoration of walls, fireplace, and over­ mantel following the simple, classic lines of the style to which the brothers Adam gave their name in the eighteenth century. Chints and leather are used in the upholsteries, but a glorified, won­derful chints with blue parrots - or some other tropical bird - perched in the midst of an orchard of blossoms. As for the chairs, they are really comfortable, as all chairs should be in a library, or in any room where you are at liberty to lounge and forget your neighbor. They are called "Marlborough," and you sink into them as into some happy oblivion of unlimited softness. The body being forgotten, the mind is free for the read­ing or meditation to which the room, with its command of "Silence," is dedi­cated. It is evident that Miss De Wolfe un­derstands that the eternal fitness of things is half the secret of good fur­nishing. She has made this reading ­room a restful place to the eye and to the body alike. There are no distrac­tions on the walls in the shape of pic­tures-with one exception, the painting of some long ago lady, perhaps of the French court, who looks as if she might prove companionable! The spacious square table in the center, with its lamp and magazines, focuses the intention of the room. Across the room from the library is the trellis-room. The walls of this charm­ing place are completely covered with trelliswork supporting vines, lending it a pleasant al fresco air - an impression heightened by the big garden vases at one end, flanking a fountain in which are a number of goldfish. This out­door style of decoration, though by no means so inexpensive as it looks, might well be copied for the smoking room of a hotel or private house. It is greatly preferable to the stuffy draperies of the usual den, whose "Turkish corners" suggest, at the worst, all sorts of germs, or, at the best, stale tobacco odors. Opening from the trellis-room are the rooms for tea and cards. These might well serve as a background for colonial dames of two centuries ago, sipping their tea from their porcelain cups of the Far East or playing a rubber of whist. Chints and rattan are there, and pic­tures have been admitted to the walls ­chiefly old, prints of eighteenth-century great ladies. 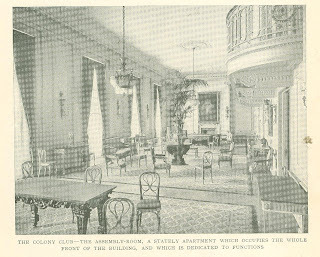 In the card room is a unique arrangement of placing two gilt with two mahogany chairs at the card ­tables. To be able to think of such small but novel details in furnishing makes the difference between inspiration and imitation. 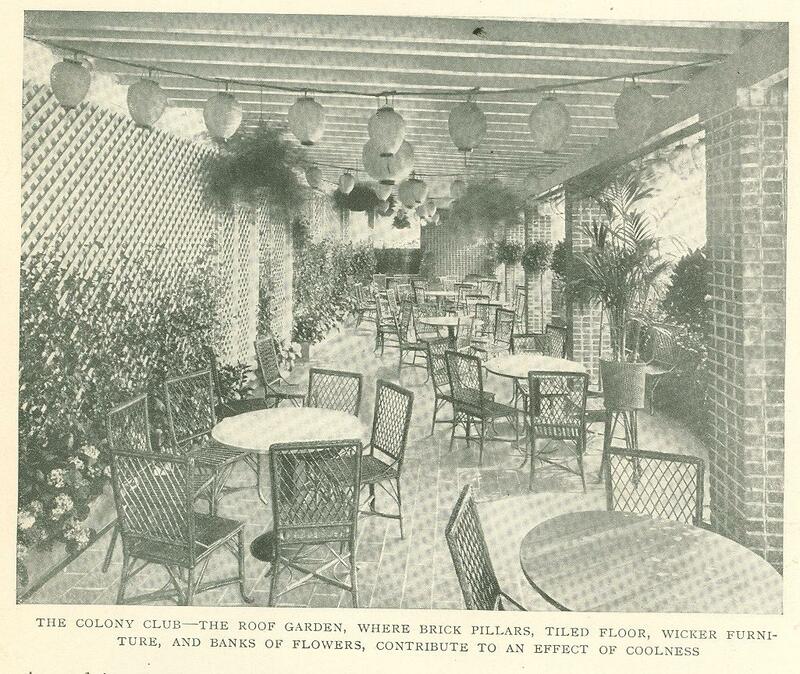 The basement of the club contains, besides the kitchens and other offices, a large swimming- pool. Here the decora­tive setting is in the form of an arbor, or pergola, from which depend cleverly imitated vine leaves and grapes. The electric bulbs carry out the arboreal idea by being set in glass grape clusters. The big. porcelain tiled pool, or plunge, measures twenty-two by sixty feet, and varies in depth from twelve to four feet. Around it are mirrors giving an illusion of distance. Not far away are rooms furnished with all the necessary appliances for Russian, Turkish, and electric baths, and for massage, manicuring, and hair­dressing, since my lady's toilet is no small consideration in the fittings of a modern club for women. Her health, too, is ministered to in a thoroughly equipped gymnasium, which has a graded running track and a basket­ball court. 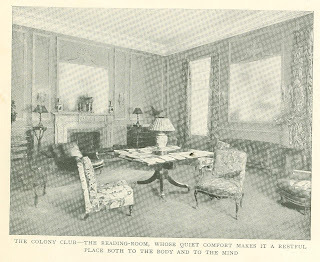 The Colony Club's assembly room is as stately as befits an apartment dedi­cated to functions. It occupies the en­tire front of the building on the second story, having fireplaces at each end, and a music gallery opening from the mez­zanine. It is quite appropriate that the French feeling should be prominent here. 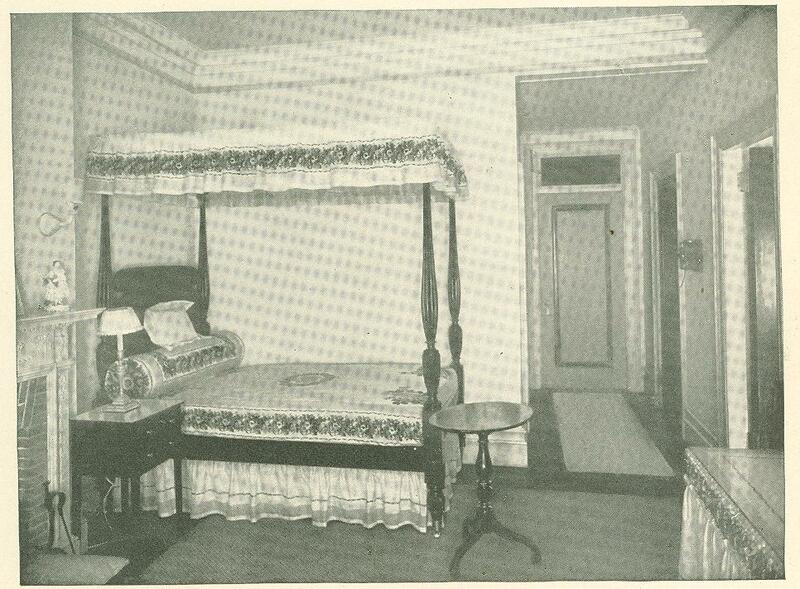 Rooms set aside for social gaie­ties lend themselves naturally to the styles immortalized by the most brilliant of the old-time courts - styles which are more thoroughly understood by Miss De Wolfe, perhaps, than any others, owing to her long residences in the French capital. The simplicity and the beauty of the bedrooms, combined with their whole­someness from a sanitary point of view, make them types of all that a bedroom should be. 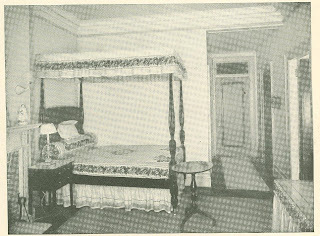 One of them - shown in the illustration boasts of a splendid four-poster, but in most of them are those simple iron bedsteads of a cane pattern, painted white, which are Miss De Wolfe's special design and patent. The walls are for the most part tinted, though in one room birds of paradise sit airily on boughs of Japanese quince. The furniture for this room is in black lacquer, with little landscapes painted on it in the old-fashioned style. Chints is used exclusively for curtains and chairs, and the dressing tables have cleanly sheets of glass fitted over their tops. In the bathrooms are such dainty touches - dear to the feminine heart, at least - as bottles with labels painted to match the prevailing color of the suite. All the linen, especially woven in France, bears the club's crest - the de­vice of Diane de Poitiers, three interlaced crescents. Judging from these bedrooms, a prominent note of the decorator's gospel is that beauty is not necessarily the result of expense, but can be obtained by a judicious combination of simple materials. On another floor is a private dining­ room in cool grays and tans and faded pinks -a Louis Seize effect, probably, but in any case delicately festive and French and creative of illusions, as such a place should be. The anteroom of this pretty apartment has a lounge uphol­stered in pink linen. As a substitute for plush, the artistic merits of this simple fabric are superlative brick-and-tile coolness. It doesn't over­look anything in particular but the neighboring walls, yet it has a fresh and pleasant aspect, which is all that can be really asked of it. Concerning the practical business of the club's housekeeping, it is scarcely necessary to say nothing could be of better arrangement. From the chefs in the kitchens to the lady's maids, perfect service is assured. Members who, how­ever wealthy, cannot escape at home a certain feeling of responsibility, find here the delightful relief of knowing that the whole burden is shifted to other shoul­ders, and to shoulders entirely capable of bearing it. The membership of the club is lim­ited to seven hundred resident and two hundred non-resident members, the ini­tiation fee being fixed at one hundred and fifty dollars and the yearly dues at one hundred. The chairman of the House Committee is Miss Elisabeth Marbury, a woman whose executive ability and business talents fit her emi­nently for the positon. Associated with her are Mrs. William Storrs Wells, Miss Anne Morgan, Mrs. William Jay, Mrs. Thomas Hastings, and Miss Mary Par­sons. Though the Colony Club is for wom­en, and is conducted by women, mascu­line advice on important matters of financial interest is not scorned, as is evi­denced by the advisory board consisting of J. Pierpont Morgan, Charles T. Barney, and Frank Polk. One of the founders of the club, Mrs. Borden Har­riman, is now its president. The two vice-presidents are Mrs. Richard Irvin and Mrs. John Jacob Astor; the secre­tary, Mrs. Walter Damrosch (formerly Miss Margaret Blaine), and the treas­urer, Miss Anne Morgan. 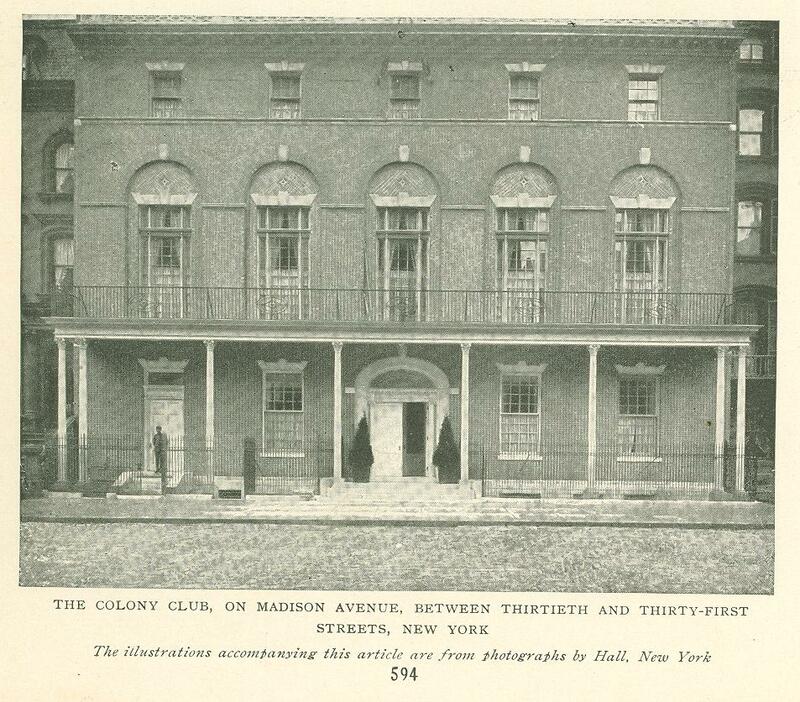 The Colony Club is, of course, the fruit of wealth, and of that high social power which when united needs only to say, "Let us have a fine clubhouse and an expert to decorate it," and the fiat is straightway accomplished. But there is no reason why other circles less fortu­nate in the possession of wealth and power should not have their own nests. Adjoining this suite is the roof ­garden, banked with flowers, and of a furnished in equally good taste and ruled with no less discretion. As a substitute for ten minute papers on "The Holy Roman Empire" or "The Origin of the Species," this English idea of a woman's club seems, in some respect at least, to be of greater and more lasting benefit to its members and to society in general. At any rate, it is much more comfortable! Originally published in Munsey's Magazine. August 1907.